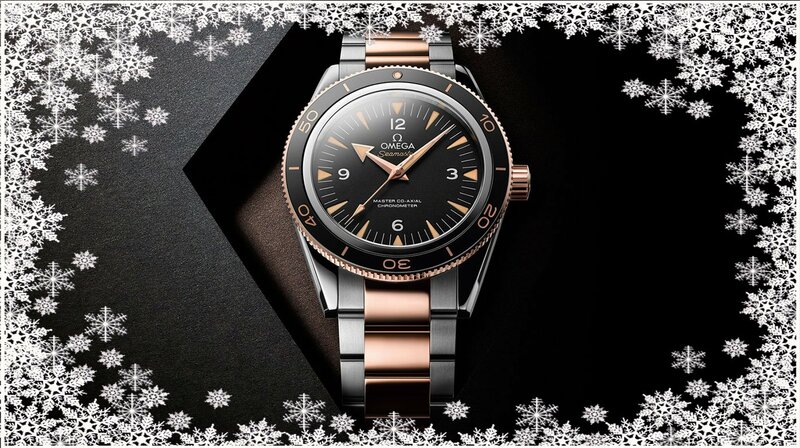 To bring even more cheer to those you love, Omega has selected eight timepieces that could make the perfect gifts. Who deserves something special this year? 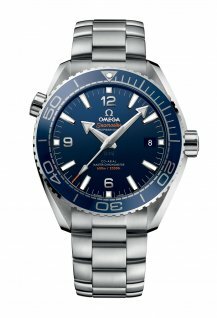 The Seamaster 300 is an icon in the world of diving watches. First introduced in 1957, its classic look has been updated for today with modern materials and watchmaking technologies. This 41 mm model offers a slick design in stainless steel and 18K Sedna gold. Its sand-blasted black dial includes 18K Sedna gold hands that are coated in “vintage” Super-Luminova, while the polished ceramic bezel has an Omega Ceragold diving scale. Take a look through the transparent caseback and you’ll find the Omega Master Co- Axial Calibre 8401 inside. The “claws” and half-moon facets are just some of the defining features in this collection. This 27 mm “Petite Seconde” model shimmers with a white pearled mother- of-pearl dial and 10 diamond indexes. You can spot four more diamonds in the small seconds function, which sits at 9 o’clock. The diamond-set bezel is mounted on an 18K red gold case, while the bracelet includes brushed links and polished bars. On the inside, the timepiece is powered by the Omega Master Chronometer Small Seconds Calibre 8705. The Seamaster Diver 300M is celebrating its 25th anniversary this year. 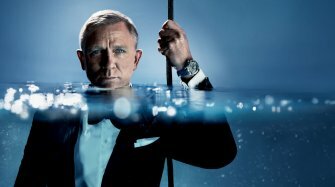 During its lifetime, this timepiece has been trusted by deep-sea divers and, of course, James Bond. Now, a new update has arrived with a fresh design. Presented on the Diver 300M bracelet, this 42 mm model has been built in stainless steel and 18K Sedna gold. It includes a black ceramic bezel with an OMEGA Ceragold diving scale, as well as a polished black ceramic dial with an ocean of laser-engraved waves. For ultimate precision, the Omega Master Chronometer Calibre 8800 sits inside. The new Trésor delivers a contemporary twist on traditional watchmaking. Its modern look is distinguished by a super slim case and diamond paving that curves along each side. In this 36 mm model, the case is made from 18K Sedna gold and is presented on a grey leather strap. The lacquered opaline silvery dial includes embossed Roman numerals in 18K Sedna gold - the same material used for the hands. 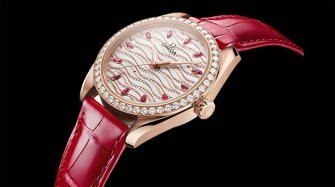 The Omega Calibre 4061 sits behind a special mirrored caseback with a “Her Time” pattern, while the crown is polished with red liquid ceramic and set with a single diamond. 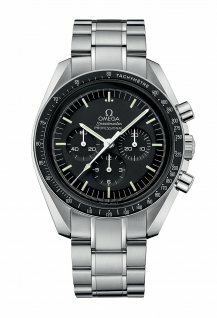 The Speedmaster “First OMEGA in Space” pays tribute to the pioneering watch that astronaut “Wally” Schirra wore into orbit in 1962. With a 39.7 mm case in 18K Sedna gold, this timepiece features a brown ceramic bezel and a chromium nitride tachymeter scale. The brown colour is also included on the subdials and minutes track, which encircles a central opaline silvery dial. The caseback includes the original Seahorse emblem, along with a number of special engravings. Finally, there is a brown leather strap with beige stitching, and a central core driven by the Omega Calibre 1861. 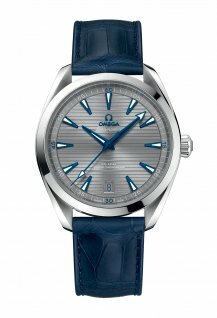 The Seamaster Planet Ocean is a tribute to Omega’s maritime legacy. A dive watch at heart, the modern design has been transformed with indulgent materials to make it equally perfect for days on shore. This model features a chocolate brown ceramic dial with 18K Sedna gold hands and indexes. The same gold is used for the 39.5 mm case, which sits on a brown leather strap with rubber lining. There is also a brown ceramic unidirectional bezel with an Omega Ceragold diving scale and an Omega Master Chronometer Calibre 8801 for unrivalled precision. 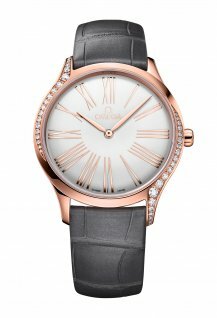 The Omega De Ville Prestige delivers a classic style with many touches of luxury. It’s a timepiece that you can wear for many years to come and it will never lose its captivating appeal. Exploring this model begins with the two-zone silver dial that includes facetted hands and domed Roman numeral indexes. The design is completed by a date window, power reserve indicator and small seconds feature. As well as having a 39.5 mm case in 18K red gold and a brown leather strap, the watch includes the Omega Co-Axial Calibre 2627. The Seamaster Aqua Terra is a companion for every occasion – whether its days on a yacht or evenings on the town. 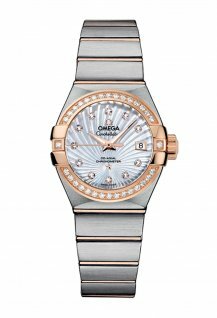 Encircled by diamonds, it’s a women’s watch that radiates beauty. The symmetrical 34 mm case of this 18K Sedna gold model features a white pearled mother-of-pearl dial and 11 diamond indexes in 18K Sedna gold holders. The bezel is diamond-set and the watch is presented on an integrated 18K Sedna gold bracelet. 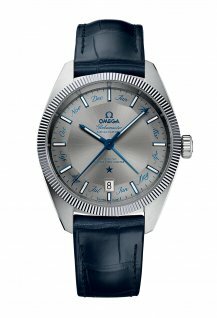 Driven by the Omega Co-Axial Master Chronometer Calibre 8801, this wristwatch is certified at the industry’s highest standard by the Swiss Federal Institute of Metrology (METAS). 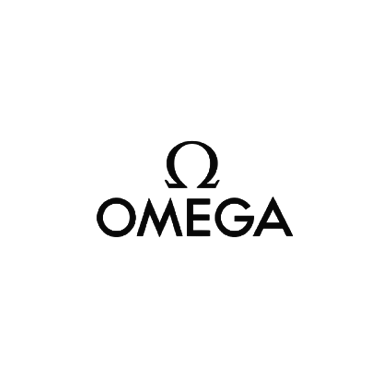 Omega presents no less than 101 new models. 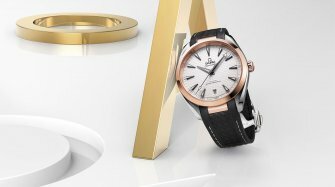 Omega presents no less than 101 new models.